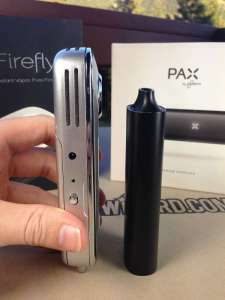 This is a comparison of two very popular portable vapes and my personal favorites, the Firefly vaporizer and the Pax vaporizer by Paxvapor. First off, I want to go ahead and say that both of these vaporizers are worth every penny. Not every person is going to want the same things in a portable vaporizer. For instance, I can completely palm the Pax vaporizer for maximum discreetness whereas the Firefly is a bit heavier and bulkier. On the flip side, I can pull out the Firefly, turn it on, vape, and have it back in my pocket before the Pax even finishes heating up. Each of these portables have plus sides and down sides. Let’s go ahead and break them down. The Firefly comes in at approximately 8.5 ounces, 5 1/2″ long, 2″ wide, and about 7/8″ tall. The Firefly is made from stainless steel to help keep the unit cool but it also adds a bit of weight. The Pax is 3.4 ounces in weight, 4 1/8″ long, 1.4″ wide, and 7/8″ tall. The Pax is less than half the weight of the Firefly and easily conceals into any pocket, back pack or fanny pack (if that’s your thing). Don’t get me wrong, the Firefly still fits in my pocket or a hoodie but it can’t be concealed in my palm to hide the obvious. All in all, the Pax definitely wins in the size category and is one of the most portable/discreet vaporizers currently on the market. If you need absolute discreetness then the Pax might be right for you. The Firefly uses a replaceable internal high powered lithium-ion battery. Most other portables like the Pax, Solo, or Ascent use internal rechargeable batteries but they aren’t replaceable. This means if you have problems with battery life or just the battery in general outside the manufacturer warranty, you might be looking to replace the entire unit. It’s also nice to take a spare battery for hiking trips, all day skiing/snowboarding or out at the beach/lake. It takes less than 10 seconds to swap out the Firefly battery and throw in another. The downside of the Firefly battery is the life itself. I get about 3-4 bowls from the Firefly before the battery dies. I get about 3-4 bowls from the Pax as well but the sizes of the bowls are night and day different. I would have to say that the Firefly wins in this category because of the quick charge time and ability to replace batteries if needed. The Pax chamber will hold about .3 grams whereas the Firefly will only hold about .15 grams. So you get a lot more out of 3-4 bowls with the Pax than you would with the Firefly. Both chambers are pretty simple to load and unload. Both have easily removable magnetic lids. The Firefly heating element is “composed of an FDA-foodsafe super-alloy manufactured in the USA.” It has an all glass heating chamber and a stainless steel vapor path. The Firefly produces the best vapor quality of all the portables I have tested. Don’t get me wrong, the Pax has great vapor quality but the Firefly beats it due to the convection engineering. 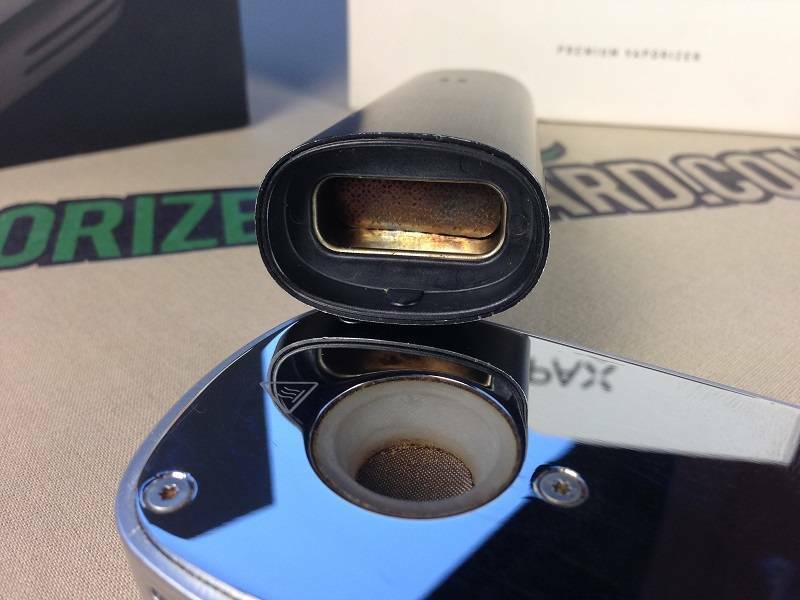 The Pax uses a non-ceramic tuned thin film heater, stainless steel oven/chamber and a stainless steel vapor path. The large oven in the Pax allows for long sessions for experienced users or you can easily share with a couple friends. The Pax is known for needing to be cleaned quite often. However, the new mouthpiece design is much better than the old and you can get away with a little more use before cleaning sessions. I still clean my Pax every 8-10 sessions and perform some slight maintenance with the mouthpiece every 3-4 sessions. The Firefly on the other hand is one of the easiest portable vaporizers to clean and maintain. I brush out the bowl after every session and clean off the window about every 10 sessions. Now it does still require some cleaning when you get over 10 sessions. The residue will start to build on the window and along the vapor path but this is minimal compared to the cleaning needed for the Pax. You can still use the Firefly when it gets dirty whereas the Pax will completely stop working. The Firefly definitely wins the Cleaning/Maintenance category and is , in my opinion, one of the easiest portables to maintain. Each of these portable vaporizers have advantages the other doesn’t and each one of these vaporizers could be someones favorite. If both isn’t in the cards then lets break it down a bit. If you want absolute portability, long sessions (10+ minutes), and don’t mind a bit of cleaning…get the Pax. If you don’t mind a slightly bigger portable, want the best vapor quality, the easiest maintenance/cleaning, and instant heat (3-5 seconds)… get the Firefly. My personal favorite is the Firefly and it’s been my go to portable vape since I bought it. Trust me, there’s no wrong choice. Let me know in the comments below which one you decided to go with and how you like it. Thanks for checking out my Firefly vs Pax vaporizer review and if you guys have any questions feel free to leave them below. 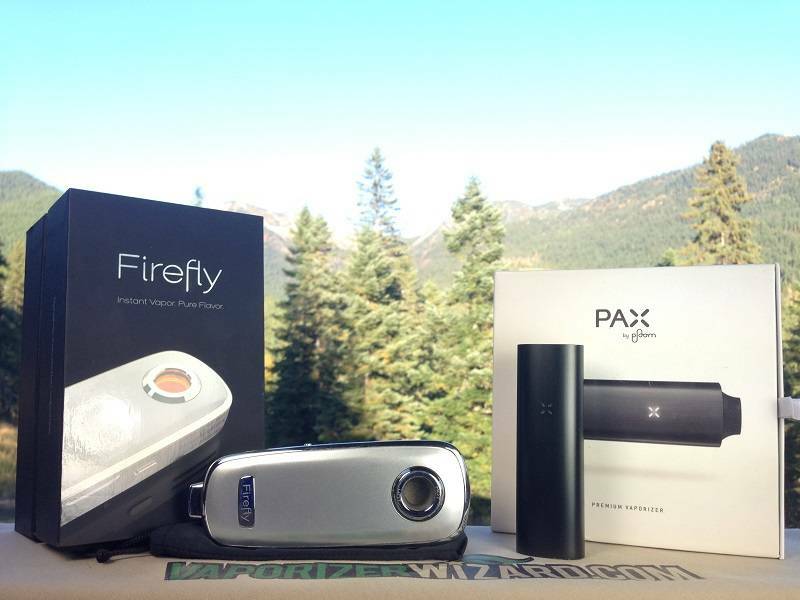 Check out the new Pax 3 here and the my Firefly 2 review here. Looking to buy a herb vapourizer! Need ur advanced opinion…. Needing it for home only, do not want a desk unit as I have children. Was looking at the firefly or a Pax. Want the best and don’t mind paying up to $325.00 for it, what do u recommend? I would suggest the Firefly, it will be much easier to just take a couple draws when you have a moment away from the kids, whereas the Pax will require a session. The Firefly will also smell quite a bit less.